Nigeria's foreign exchange market was tension-soaked yesterday, as the Naira raced towards N500/USD1. 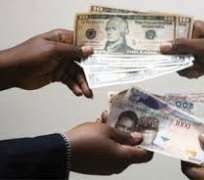 It closed at N490/ USD1 in the parallel market, with dealers expecting further rise today to hit the dreaded N500 mark. Surprisingly, the Naira appreciated significantly to N305/ USD at the official interbank market same day, although dealers said foreign exchange was not available to most of the bids. Meanwhile, the global investment bank, Morgan Stanley of United States of America, has warned that its MSCI Nigeria Indexes would be reclassified as Stand-alone next year, if currency restriction was instituted by the Central Bank of Nigeria, CBN. Also the World Bank said, yesterday, that Nigeria and South Africa would drag down Africa's growth rate by 1.6 per cent in 2016, as strings of negative economic indicators continued. Naira exchange rate had been on speedy downwards against major international currencies in the past few days, dropping from N425/USD a week ago to the current level which showed about 15.3 per cent depreciation week-on-week, the fastest so far since the June 2016 official devaluation. As usual, dealers blamed the development on scarcity of foreign exchange, occasioned by CBN's inability to intervene with significant quantity of foreign exchange. However, a new environment of speculation appears to have taken hold of the market as most dealers are now hoarding whatever they have, while hiking the rate against a speculated depreciation. One of the dealers in a commercial bank stated: 'The trend since this week has been driven by speculations that Nigeria was running out of reserves as real demand continues to grow faster than supply. There is also report that traders in Nigeria and from neigbouring countries are swelling the crowd of speculative purchase of US Dollar in Nigerian markets. President of Association of Bureau de Changes in Nigeria, Aminu Gwadabe, told Reuters: 'Traders from neighbouring countries and some importers had also been moving in recently, mopping up dollars and putting pressure on the Naira in a possible speculative bid.' – Vanguard.